My emailbox is always full of interesting stuff. Today I got a marketing piece from CREDO Mobile, America’s only progressive phone company. 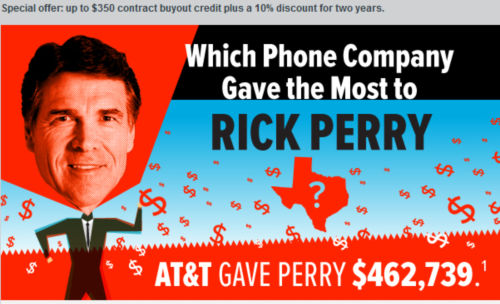 The subject line of the email was “Why did AT&T give Rick Perry $462,739?” (since 2000). 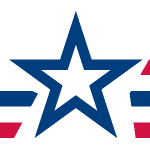 Anyway, if you are looking for phones that are no cheaper with plans that are no cheaper than anywhere else BUT you want to support progressive politics that are just as bad as other winger politics then perhaps you should consider CREDO Mobile. Below is the introduction from the email marketing piece that I got today. 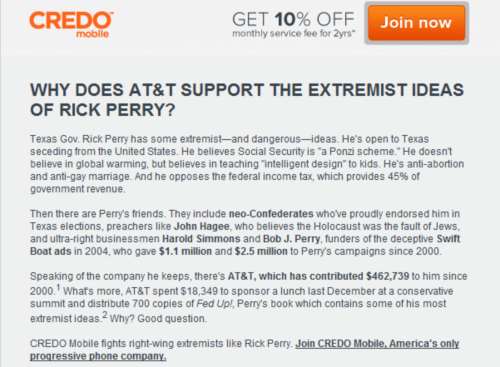 CREDO Mobile certainly is putting Rick Perry to work creating business for their product line and services.